In Fukuoka prefecture, you can find gorgeous black taxies designed Hakata-ori Textile, a famous, traditional art craft in Fukuoka. Against the shiny black body, striped pattern called Kenjo is printed on the hood and the side. 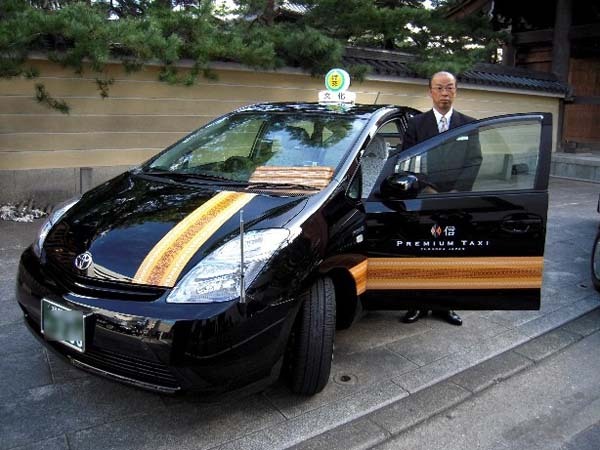 The taxi is called Premium Taxi and there are five different colors; purple, green, red, yellow, and dark blue. These five color Kenjo patterns are called Goshiki Kenjo in Japanese. They were presented to the shogunate government in Edo period (1603-1868), that is how the patterns were started to be called Kenjo, which translates “present” in English. The Premium Taxi service was started in November 2009 to revitalize the town with its specialty. Currently, 26 taxi companies in Fukuoka operate the taxies. The drives wearing Hakata-ori ties host the passengers.